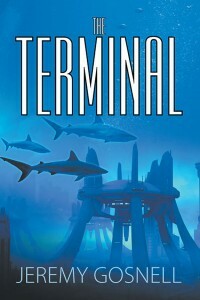 Buy The Terminal by Author Jeremy Gosnell | Garrett Mentors, Inc. Author Jeremy Gosnell is generously donating a percentage of the proceeds of the sale of his newest novel, The Terminal to our organization! Purchase your copy at the Book Mark’et in Oakland, Maryland, or here! Scuba diver Eric Rayner disappears while diving at Dean’s Blue Hole in Long Island, Bahamas. Atlantis researcher Allison Chandley is approached by Italian billionaire Sergio Franca. USGS political liaison Walker Reade is studying a report by a young seismologist detailing a possible eruption of the Yellowstone Caldera. Each of these seemingly unrelated incidents is tied together, leading to an incredible journey back in time to the ancient kingdom of Atlantis. While following in Eric’s footsteps, Allison is whisked away, pulled 70,000 years into the past to end up in the fabled Atlantis. She finds the kingdom in shambles and under constant attack by strange creatures called the Abaddon. When Allison is captured by the creatures, the people of Atlantis deploy an ancient biological weapon to destroy them. Eric and Allison must join together to find a control system called The Terminal, which can alter time and space. The Terminal is a stunning sci-fi thriller that adeptly explores how a past civilization could exist and what that existence could teach today’s world. Jeremy Gosnell is a magazine writer and a long-time marine aquarist. He lives in the mountains of western Maryland and was inspired to create this story after reading Graham Hancock’s writings on a pre-classical era civilization. His biggest challenge was “tying human genetics, ancient history, and seismology together to create a story that leads back to an ancient kingdom, written about long ago by Plato.” He enjoyed envisioning a scientific picture of what Atlantis and its people may have been like. Watch Jeremy’s Pechakucha talk about his work, here!